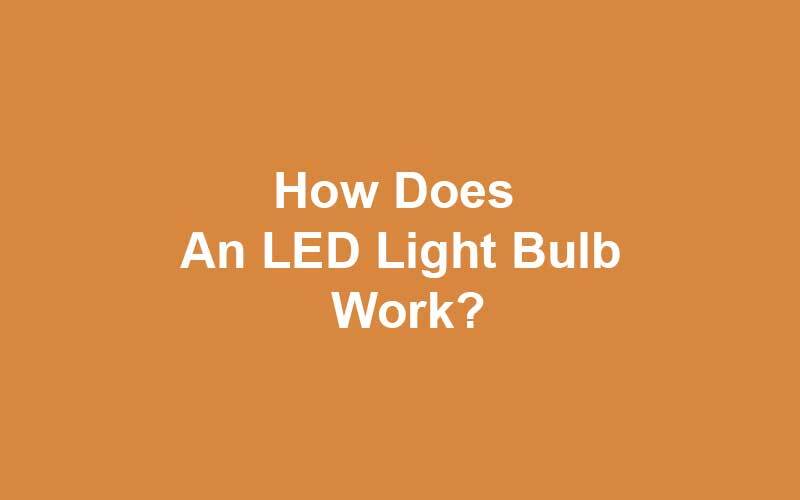 →How Does an LED Light Bulb Work? LED or light-emitting diodes are semiconductors which can easily fit into an electrical circuit. These bulbs will be used vividly in the future because they will be good for the environment and will also reduce cost. An LED carries electrical current in one direction, and it is mainly illuminated by the electrons roaming around the semiconductor material. Light-emitting diodes are more long-lasting than the traditional incandescent bulbs. Although the incandescent bulbs have been a blessing for us since the 1800s, it comes with a lot of disadvantages. The major drawback of incandescent bulbs is that it loses most of the energy as heat while LED is about more energy and lesser heat. Plus, the average lifespan of a LED light bulb is 50,000 hours which is far better than the incandescent ones. These bulbs started as headlights or traffic lights but now people are becoming more aware of the benefits it can offer, and we can now see them being used in homes too. In this technological age, people are concerned about having a technology which is good for their budget and environment too. LED can undoubtedly ensure a healthy environment which we can't ensure while using incandescent bulbs or CFL (Compact Fluorescent) bulbs. Nick Holonyak Jr. is the inventor of LED or light-emitting diode. From the name, we can see that it is a diode which emits light. The diode is mainly a semiconductor, and the conductor material is aluminum-gallium-arsenide. LED is an SSL (Solid State Lighting) technology. The semiconductor material is solid that helps it to emit light. This semiconductor of LED has a positive and negative side. The positive side of the LED bulb has holes or openings for electrons while the negative side of the semiconductor has a lot of free particles moving around the area. The diodes of the LED bulbs are the main reason behind the emission of light by the bulbs. Each diode emits light through a p-n junction. In the p-n junction, the p-type semiconductor mainly contains positively charged carriers while the n-type semiconductor contains negative electrons. LED bulbs are modified in such a way that when an electric current passes through it, the electrons from the n-type semiconductor connect with the carriers of the p-type semiconductor. This way, the n-type semiconductor fills the holes of the p-type semiconductor. The flow of electron is always from the negative side to the positive side, and it can never be the other way around. This ensures that the electrons are changing their state constantly and can wander around the semiconductor surface. As the electrons change their state, they go from a higher orbit to a lower orbit, and they lose energy. A photon is emitted as a sign of energy loss by the electrons. Thus, LED light bulbs can emit light. The higher the amount of energy lost by the electrons, the higher the frequency of the light photon is. Traditional incandescent light consumes a lot of energy, and most of it is spent on its heat. But LED lights are energy saving lights as it produces more light than heat and thus these are energy efficient lights. The way LEDs can remain cooler during operations is through its heat sink plate. Heat sink plate can be made with a variety of materials, but mostly it is made with the use of aluminum. It is used as a part of the design of the LED bulbs. After turning on an LED bulb, the heat sink will turn hot, and it usually transfers the heat from the plate to the air surrounding the plate. Thus it keeps the LED bulbs cooler, but if anyone puts an LED bulb in an enclosed fixture, it will result in the bulbs getting hotter as the heat sink will not be able to work correctly. Keeping the light in an enclosed fixture also reduces the lifespan of the bulb. As the electrons in the LED bulb can only move in one direction, it makes the bulb unidirectional. If we use the bulb in a table lamp, we will see that the light will only be directed to the ceiling and won’t be reflected much to the table. This is also true when we use the bulb to lighten up our rooms. LED bulbs are unidirectional, and thus it can consume the emission of light in one direction only resulting in a dimmer light than the incandescent ones. Manufacturers are trying to change this situation. They have already introduced 60-watt LED bulbs which are far more effective than the regular ones and can generate more light. More so, Omni-directional LED bulbs have been brought to the market for consumers. LED bulbs are mostly unicolor, and the color of the bulb can have an impact on the color of the light. But these days, people want lights with different colors, and thus the manufacturers have addressed this situation. They are controlling the energy flow of the electrons in the semiconductor which is resulting in bulbs of different colors. One of the major problems of the aging LED bulbs is that they get dimmer. When a customer buys an LED light, it is usually brighter. This brightness dims down with time which happens because the semiconductor wears out with frequent usage. The lights don't burn out literally, but they do dim over time. Thus the manufacturers often don't guarantee a lifespan of 50,000 hours while selling an LED bulb as it loses 30% of its focus range within 3 years. LED bulbs are more energy efficient than incandescent bulbs and ecologically viable than CFL bulbs. These bulbs are made of simple semiconductor matter and are very useful. The dynamics of how the bulb works is effortless to understand, and the flow of electron idea explains the whole of it. These bulbs were mostly used in mobile phones, headlights and traffic lights. But the idea of using these lights in houses is increasing with time.